We gather in solidarity with the family and friends who have lost loved ones to homicide in the past week. Please join us to take a pledge of nonviolence and build the movement of non-harm. 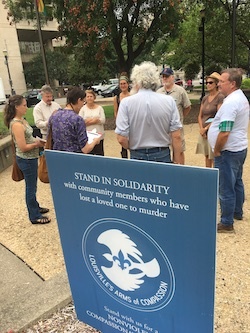 We gather at Louisville’s Jefferson Square Park, (West Jefferson/6th Street) Fridays at Noon. Please note: We do not gather if there have been no homicides reported that week. Check with the DGCEC office to confirm the event happening each week.